Earlier in the year I wrote about trying new things, and how that resulted in our building a sukkah each year. Now I’d like to tell you about trying new things for Passover. Like everyone, we are constantly struggling to find the balance between doing things the same way we’ve always done them versus trying something new. Everyone has one specific recipe that they really want served at the seder meal, but, if we only make the favorites, we would never try anything new. Occasionally we need reminding that those old favorites were once new and, if we hadn’t tried something new that year, we would never have discovered this new favorite. This isn’t a story about a chicken recipe, or about a new, favorite dessert. Rather, it’s one of the more overlooked items, but one which almost all of us have at some point during Passover – horseradish. For years, we bought a jar or two of horseradish as part of our Passover pantry. We used it during the seder, and whatever was left over would sit in the refrigerator, often until the next Passover, when it would be discarded in favor of a new jar. The horseradish root that was on the seder plate didn’t stay in the refrigerator nearly as long, but came to the same ultimate end as the jar of horseradish. 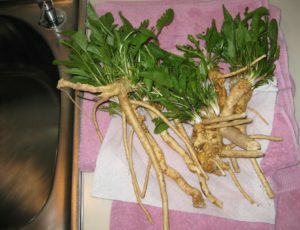 But one year, Lynn thought it would be interesting to do something else with the horseradish root after Passover. Just for fun, she put the root in water, waited for small shoots to develop from the main root, and then she planted it. We have a small area in the back yard that wasn’t being used for anything, between a wood pile (now gone) and the house, and that is where she planted the supermarket horseradish root. The following year, we saw a few leaves where the horseradish was planted, but I thought it would be better to give it more time rather than dig it up. So, we let it stay in the ground for another year. By the following year, it was clear that we had to start harvesting horseradish. This small, previously-unused area of about 20 square feet now had horseradish growing all over it. I looked online to find a recipe for preparing horseradish. That year, for the first time, we didn’t buy any horseradish – neither a root nor a jar. I learned how to adjust the recipe to make the prepared horseradish hotter than what typically comes in the jar, and we all discovered that eating a solid piece of horseradish isn’t nearly as hot as we expected. Digging up horseradish is also an activity that I do with my grandchildren, even if all we’re digging up is a piece to put on the seder plate. It has been years since we have purchased any horseradish, but we always have more than we need. We’ve even supplied some to friends and neighbors without any danger of running low. After I dig up the roots, I trim off the small pieces and put them back in the ground. They’ll be ready to harvest in a few years. If you want to try it, I use the recipe below (adapted from Serious Eats), scaling it up or down, depending on how much root I dug up that year. Note that the time you wait after chopping the horseradish is the key to how hot it will be! And it helps if you can do this with a window open and a fan blowing across your work area. Wishing you a happy Pesach, and hoping you’ll try something new! Place horseradish in the bowl of a food processor and pulse until finely chopped, stopping to scrape down the side of bowl as necessary. Add vinegar and salt 1-2 minutes after horseradish is chopped for a mild horseradish, or 5 to 7 minutes for a hotter horseradish. Pulse to combine. Immediately move horseradish to an airtight container and store in the refrigerator.